Poor CNN! One day they are reporting the death of the wrong celebrity, then clueless Alisyn Camerota gets destroyed by Sebastian Gorka. Now, we discover that Clueless Camerota can’t even manage to stack a citizen panel correctly.Camerota is CNN’s version of Megyn Kelly. Her hatred for Donald Trump is visible, which is a perfect match for CNN’s anti-Trump agenda. Camerota is CNN’s Megyn Kelly and her hatred for Donald Trump is clear, which is a perfect match for CNN’s anti-Trump agenda. The fake news network makes no attempt to hide its anti-Trump bias, which is probably why they are being beaten in the ratings by reruns of Yogi Bear cartoons. No kidding, Yogi retreads are more popular than fake news from CNN. 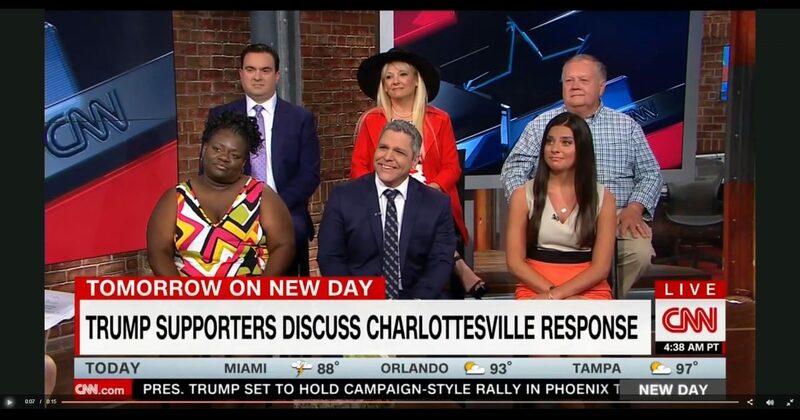 In the video, below, Camerota has assembled a panel of six Trump supporters. Surely, like the pinheads who work at CNN, they will all be outraged by President Trump’s remarks regarding the Charlottesville tragedy. So, requesting a show of hands, Camerota asked how many “were troubled by the president’s response to the violence in Charlottesville?” Nary a soul raised his or her hand. They just sat there and smiled. Not getting the response she wanted and expected, Camerota ended the segment immediately, cutting to a commercial. Alisyn dear, here is your problem. You are simply not bright enough to stack a panel. I suggest hiring Hitlery Clinton as a consultant to teach you how it is done. Her handlers will hook you up with flaming liberals who will swear on a six-foot high stack of bibles that they voted for President Trump and now they regret it because they see what a racist, white supremacist, sexist, homophobic, Islamophobic, xenophobic, misogynist he is. You will be guaranteed a segment of 100% hand-raisers. They will remove their clothes, raise both hands, and stand up and shout, “Trump is a racist,” if you like. They may all have terrible accidents leaving the studio or commit suicide as soon as they get home, but what do you care, you only need them for one segment, right? Hitlery has plenty more where they came from.